Festivus concludes with an unhappy ending as Joe Kuzma and Brian E. Roach breakdown the Pittsburgh Steelers 31-28 loss to the New Orleans Saints. 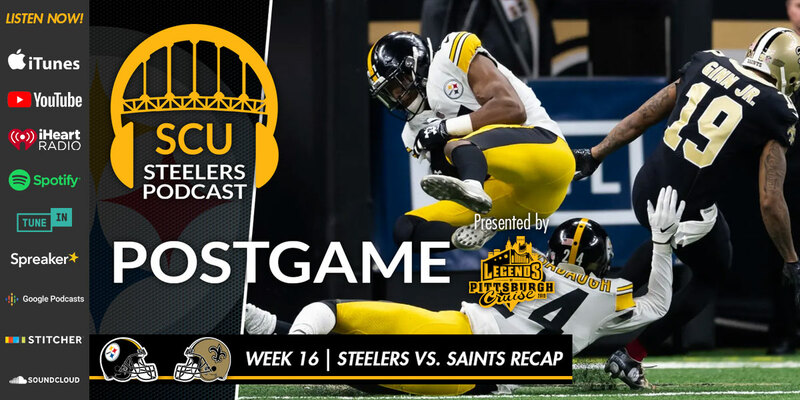 Headed into Sunday’s game, many Steelers “fans” didn’t think that Pittsburgh could overcome one of the NFL’s best teams, however, as Joe and Brian explain, it wasn’t just the Saints that the Steelers were up against. Yes, the word “homer” will get thrown around some more, as well as some local dignitaries whom also fall under that umbrella for calling out questionable and impactful calls, but he hosts also dig deeper to explain how the Steelers have put themselves in this position, and how they could’ve avoided a loss in Sunday’s game… as well as a tiny bright light at the end of the tunnel that could signal that their 2018 season isn’t entirely over with just yet. Over 20 Pittsburgh Legends + 1,000 Fans will Sail the Caribbean for the 5th Year on March 4, 2019. Join JuJu Smith-Schuster, Rocky Bleier, Willie Parker, Andy Russell, Antwaan Randle El, Donnie Shell, Santonio Holmes and more to be announced on the 5th Annual Legends of Pittsburgh Cruise. For reservations and more information, including our special offer promo code (SCU19), visit https://www.steelcityunderground.com/legendscruise/.